Michigan Tech’s Director of Bands, Mike Christianson performs with the John Hollenbeck Large Ensemble. 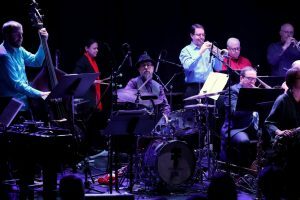 The JHLE recording: “All Can Work” was today named one of the “Best in Jazz 2018” by the New York Times — the only large ensemble to make the list. Mike is pictured playing trombone with the JHLE at Le Poisson Rouge in NYC. He is the trombonist closest to the drums, which are played by composer/leader John Hollenbeck. Lead trumpeter Tony Kadleck (red shirt in the back) is also lead trumpet in Maria Schneider’s Jazz Orchestra, and lead trumpet in Broadway’s “Frozen: The Musical”. Kadleck will be playing with the MTU Jazz ensembles here in March!